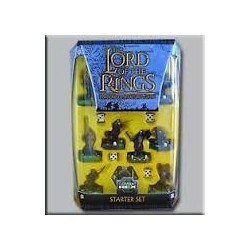 Take command of the Legions of Middle-earth with the LoTR: TMG. Destroy the One Ring or claim its terrible power for your own in this fast paced game that uses expertly pre-painted miniatures, and the intuitive Combat Hex rules system to deliver the excitement of the Lord of the Rings movies right out of the box. There are 4 phases in every turn. Each turn starts with the Strategy phase, where players roll to determine who is the attacker and who is the defender for that turn. The player that rolls the highest can choose to be either. The next phase is the attacker’s Action phase. In this phase, each of the attacker’s warriors can take one action. A warrior can move, shoot or do nothing as its action. Once the attacker is finished with all of his or her actions, the defender now gets their action phase. The final phase is the Combat phase. This is when your warriors fight. Warriors killed in this phase aren’t removed until the very end, so they will at least get to fight back if they are struck down.